Royal Australian Air Force staff courses had their genesis with the War College at Mt Martha in Victoria during the latter stages of World War II. A RAAF Staff College was subsequently formed at RAAF Station Point Cook in 1949, relocating to RAAF Base Fairbairn in 1960. Annual reunions of Staff College graduates held at the College were well attended until the mid-1980s when attendance dropped to less than 20 despite a graduate body in excess of 1200. In 1987 the late WGCDR Ted Ilton (Ret’d) with the agreement of the then Commandant GPCAPT Noel Montgomery undertook to explore the viability of an “old boys’ Union” in an attempt to turn around this decline. to promote a continuing awareness within the RAAF and elsewhere of Defence issues and of air power in particular. 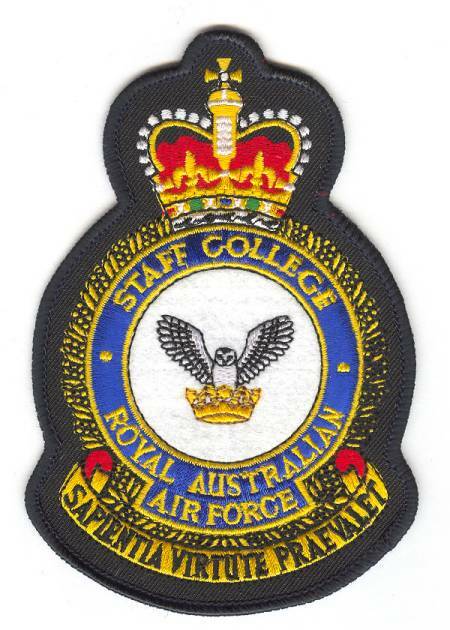 Every paid-up member of the Association was granted life membership when the RAAF Staff College closed in December 2000, and from that time the Association has expanded its membership to those who attended the Joint Services Staff College, foreign national Service Staff Colleges or Command and Staff Colleges, and more recently to those Air Force personnel who attended the Australian Command and Staff College, and Centre for Defence and Strategic Studies at Weston Creek. Today the Association has around 180 members on its books with about half living in and around the ACT. Initially the Association held ‘reunion type’ events in conjunction with the annual RAAF History Conference, which attracted quite a large following. However, since 2003 the Association has focused on holding luncheon seminars in Canberra three times a year to which a guest speaker is invited to address a topical matter of relevance to the RAAF and to the development of air power capability for the ADF. These seminars, as far as possible, are timed to coincide with such activities as RAAF conferences and RAAF retired officers dinner, likely to attract ‘out posted’ members to Canberra. While members are now ageing, Association numbers are being steadily bolstered by the influx of graduates from later RAAF Staff College courses, overseas staff colleges and the Australian Command and Staff College and Centre for Defence and Strategic Studies, particularly with the Australian Defence Colleges Association having wound up. The Association’s Executive Committee remains acutely aware that the Association must remain relevant to the interests of its members and seeks to provide a speaker program, and other activities as appropriate to this imperative. Doug Hurst’s 2001 history of the RAAF Staff College, ‘Strategy and Red Ink’ can be downloaded (27 MB file).